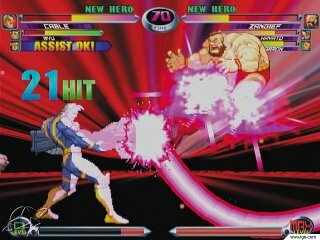 Capcom has shaken things up a bit with Marvel vs. Capcom 2. For starters, the six-button, three-strength system that has served all of the Street Fighter games for the last decade has been replaced with four buttons, with two punches and two kicks. The buttons that used to serve as fierce punch and roundhouse kicks are now used to call in your offscreen characters for helper attacks, which leads us to the other major change in MVC2 – you now select three characters instead of two. Also, your super combos can be linked together. If you pick the right three characters and link your supers together just right, you can get combos that range in the hundreds of hits. 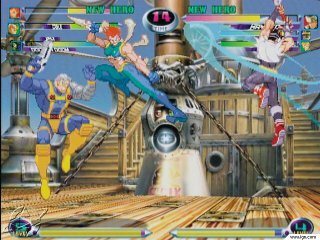 Beyond that, it’s roughly the same collection of fighters from the first Marvel vs. Capcom with a few new characters, such as Cable, Jill Valentine, and Amingo thrown in, and some old characters, like Iceman, brought back from previous Marvel-licensed fighters. 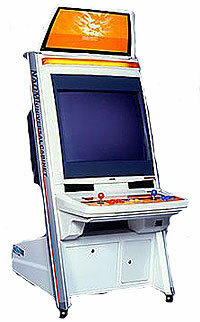 The gameplay is still very similar to that of the previous Marvel vs. Capcom, with a focus on screen-filling fireballs and ridiculous button-tapping air combos. Like its predecessor, it isn’t the most balanced game in the world, but that doesn’t keep it from being a great deal of fun. To go with the updated gameplay, the graphical style of the game has been similarly updated. While the characters are still made up of 2D sprites, the backgrounds are pretty amazing 3D scenes, full of movement and vibrant color. The soundtrack is also worth mentioning. While the sound effects are of the same great quality that you’ve come to expect from Capcom’s fighters, the music is anything but what you’d expect from a fighting game. While previous games have been accompanied by the typical style of rock and techno that make up most game soundtracks, MVC2 features a strange sort of jazzy lounge music. You’ll either love it because it’s so hilariously out of place or be annoyed to death by its happy, upbeat rhythms.